It's been a year since the last time I blogged. I don't understand it myself, so don't ask me to explain. Just know that I am hoping to get back in the swing of things, and this easy and healthy dinner I made last night seems like a great way to start things off again! So this combo of ingredients came to me while I was driving home from work yesterday and when I came home to look for a recipe it seems that I am not as clever as I thought I was. There were about 300 recipes out there and they were all different. I decided I would just make it the sway I wanted to. 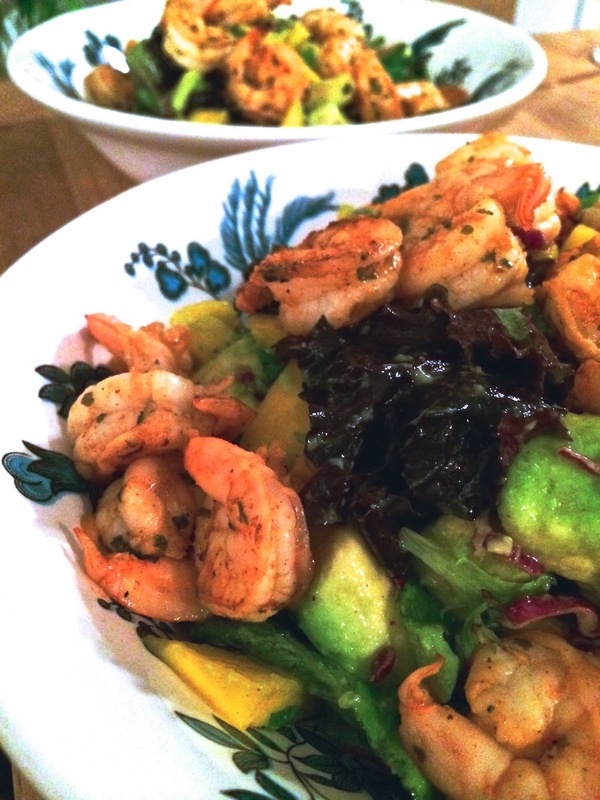 So here is my version of a Shrimp Avocado and Mango Salad. And how it's been since my first post all those years ago, this is a no recipe, recipe made with tons of love! These measurements will make about 4 small salads appetizer size, or 2 big dinner size salads. Shrimp. I used about a pound of large shrimp. You need like 18-20. Or as many as you want.